MPAA Rating: R for for violence, language and drug content. Running time: 126 minutes. Released by Radius-TWC. The citizens of Earth attempt to fix global warming by spraying a chemical known only as CW-7 into the upper atmosphere. Instead of cooling the planet to livable temperatures, this initiated a global Ice Age, freezing and killing all life on the planet. 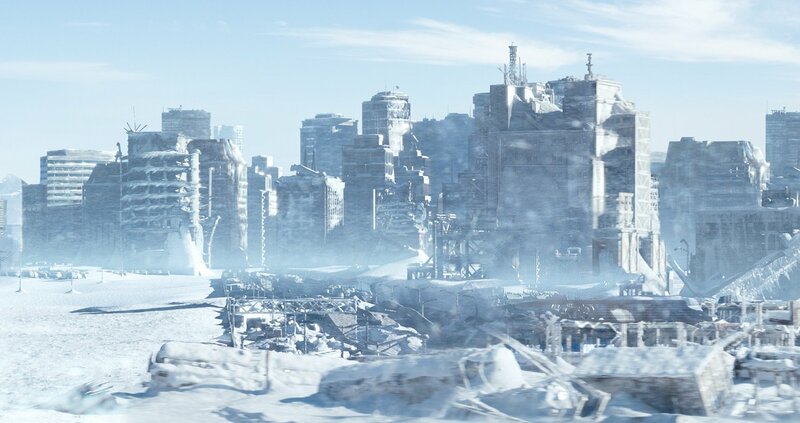 The only remaining survivors – those aboard a massive transcontinental railway train called the Snowpiercer – are the last chance humanity has, and it’s not looking so great. Say what you will, but those aboard the Snowpiercer have won. They’re the crème de la crème. They are what Hubert Spencer talked about when he originated the phrase “survival of the fittest.” However, they’re at two extremes: the first group closer to the front of the train are the wealthy, being able to buy what they want with their privilege, while those at the tail of the train are the dregs of society, the freeloaders who barely even count in the eyes of the moneyed, and they’ve fought and killed to be where they are. The ones in the middle of the train are the ones responsible for feeding and entertaining both sides. Now, it’s time for a little revolution. The film Snowpiercer throws a lot of metaphor and symbolism at us, being (among other things) a thinly-veiled satire concerning where we stand as a society. Rich folks live in their opulence, eating sumptuous food, treating the poor with disdain (especially Tilda Swinton’s character, Mason, a Minister of sorts with whatever government exists on the Snowpiercer), with one scathing example in the form of a little girl spouting off hate-filled, ignorant horror stories about “the Tail Sectioners” and their behavior. The poor live in squalor, relying on gelatinous protein bars as their only sustenance, sleeping in overcrowded bunks, with no bathing facilities and no privacy. And lest ye wonder, there is a middle section, but it’s barely populated; it’s more for the day-to-day operations keeping the people on either end of the train fed… all of which pretty much reflects what’s going on in our world today. 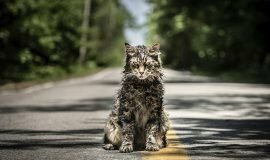 In an effort to try and change life for the Tail Sectioners, a slow-brewing revolution has finally come to a boil, led by Curtis Everett (Chris Evans), his second-in-command Edgar (Jamie Bell), and Gilliam (John Hurt), the revolt’s adviser and sort-of father figure. 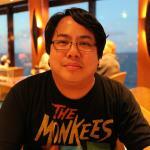 They want what the other half has – opportunities, luxury, good food. Curtis, however, seems to have a large stake in what he’s doing – he viciously needs to confront the train’s creator and owner. It’s his driving force and his single-minded, defining purpose. Accompanied by technical wizard Namgoong (Song Kang-ho) and his clairvoyant accomplice Yona (Go Ah-sung), “The Great Curtis Revolution” storms their way from the back of the train all the way to the front. The rest of the revolution smells a little like the 99% and the Occupy Wall Street push for equality that so dominated our network news for a long time, eh? Based on the graphic novel “La Transperceneige,” Korean director Bong Joon-ho’s Snowpiercer is a perfect allegory for today’s economic and social struggles. 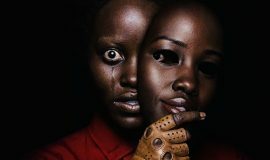 Bong does it with familiar imagery and themes, all the while maintaining his own creative course. 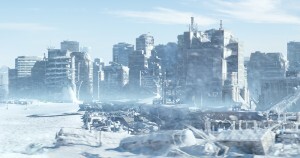 One could easily say that several modern action/science-fiction/post-apocalyptic movies are direct influences on this picture – the living conditions of James Cole in Twelve Monkeys, the revolution of Zion and Neo’s meeting with the Architect (and its revelations) in The Matrix Reloaded, the sharp divide between the haves and have-nots in Escape From New York, and other such films. Bong creates some memorable imagery, such as a fight in total darkness, where the train security has night-vision goggles and the revolutionaries are swinging wildly, often hitting one another instead of their intended targets. A heavy-handed metaphor it may be, but it’s still effective and makes you wonder about what we, as a society, are doing to ourselves while the other half laughs. Evans, as Tail Sectioners leader Curtis, commands the screen with a heavy-hearted performance, weary of what he’s had to do to get where he is, much less just to stay alive. He carries this film and his emotional weight well in a performance that’s a complete 180º from the other films he’s been in lately, and he should be proud to have this as a feather in his cap. 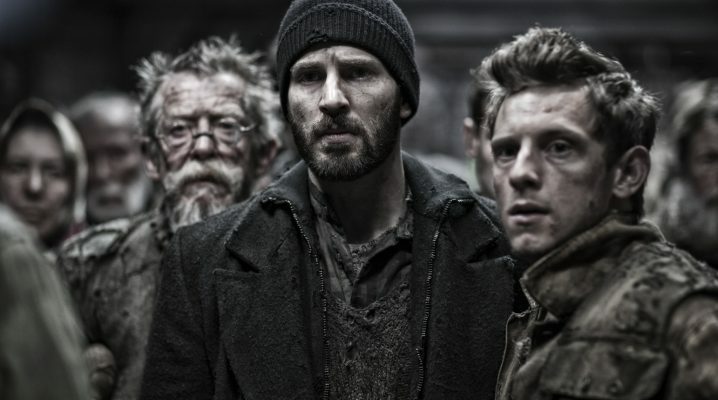 While not the most original or perfect film, Snowpiercer does raise questions about humanity and our own personal morals. Are we here to merely serve someone else’s purposes, like cogs in a machine, or are we meant for something greater? 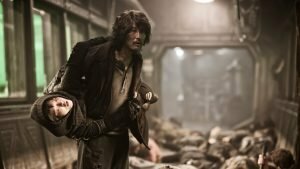 A sharp script (co-written by Bong Joon-ho and Kelly Masterson) keeps Snowpiercer plodding along, much like the train itself, throwing not just science-fiction action at us, but a healthy dose of existentialism and philosophy as well. Mature and thoughtful, Snowpiercer is a purposeful thinking man’s action film, sacrificing nothing to make its barbed, satirical point.